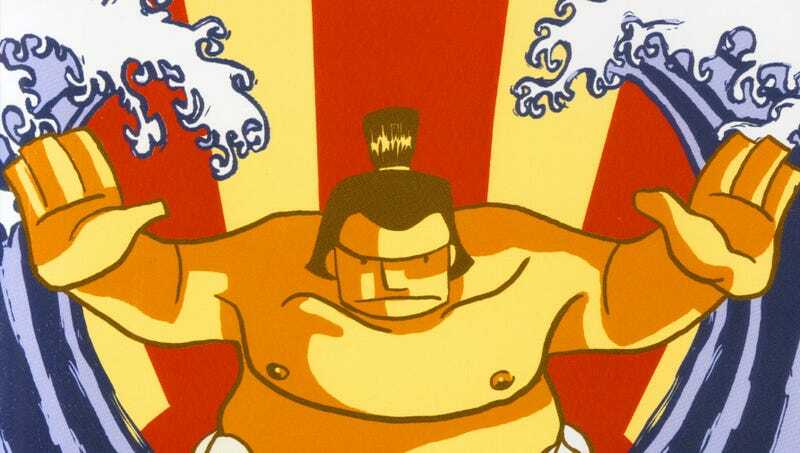 Don't go in expecting E. Honda or Ganryu-style throwdowns in this new graphic novel about sumo wrestlers. Giant near-naked men do slap each around in Sumo, but the true pain comes from one transplanted quarterback's broken dreams. Like a string of haiku, Sumo captures moments in time, remarking on the power that comes from their transience. Thien Pham's slim volume concerns itself with the wounded heart of Scott, shattered after the exciting promise of an NFL career gets scuttled by an injury. Adrift in his hometown and freshly dumped by his high school sweetheart, Scott decides to move to Japan and try to find a new life there. For all the pain and loneliness that Scott seems to bear, Sumo is a wistfully gentle read. Scott is in a place where many people have been, resolved to create a fresh start but unsure of one's ability to do so. Pham's art style scales the detail up and down in an inviting way and the book's pacing and use of color focuses on pulling you into quieter depths. It's an unexpectedly tender take on a sport that suffers from stereotypical takes. Find it and read it.